Situated in Glasgow’s most attractive and desirable area and just a stone’s throw away from the vibrant shops and restaurants in the West End and Byres Rd is this fantastic apartment. Whether you are looking for a comfortable family base, laid-back theatre trip or an event packed weekend, this apartment will cater to your needs. Not only are you within walking distance of a host of Glasgow’s major attractions it is just a short 10 min train journey into the city centre. This 2nd floor apartment boasts a traditional Edwardian tenement style and we have maintained original features within the property. Throughout the property there is intricate ceiling cornicing, large bay windows and high ceilings; which typify this style. The spacious and airy rooms can happily accommodate up to 8 people for all manner of occasions. Gather with your family and friends to relax with a bit TV or a movie after a hard days shopping or get your celebrations started early before you hit the town in the cool and casual living room. For those quiet, cosy nights in, this apartment is set up with a TV,DVD player and WiFi access, so you can get comfortable, sink in to the sofa and forget the hustle and bustle outside. Fancy taking a break from the vast array of taste temptations around the property? No problem, feel free to show off your culinary skills in this property’s sleek, modern kitchen. You will find all that you need to wine and dine your friends around the contemporary dining table. The modern contemporary bathroom features a large bath with an over bath shower to soak away the stresses and strains of a day’s shopping. When you are ready to wind down for the night, there are 3 spacious bedrooms to settle in to. Two bedrooms consist of comfortable large king beds and the third bedroom contains a double bed. For an additional two guests, there are folding single beds. Sleeping arrangements Three double bedrooms and 2 fold out beds for additional guests or separate sleeping arrangement. Exterior The property forms part of the historic Edwardian West End which has recently been awarded the internationally recognised Great Neighbourhood Award.. The area features a wealth of historic buildings and parks including the Botanic Gardens and Kelvingrove Museum and Art Gallery. Byres Road is just 5 mins walk away and offers a host of fine restaurants and a plethora of independent shops. 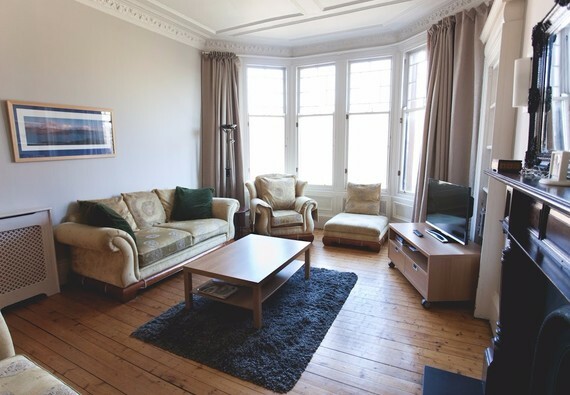 The city centre is easily accessible on foot or by a 10 min train journey from Byres Rd. SECC/Transport Museum are c 25mins walk away. Parking notes Free on street parking outside property. Apartment family friendly with large and well equipped playpark just 2 mins walk away. Underground train station 5 mins walk away and 10min journey into the centre of Glasgow. Interior layout The apartment is a traditional 18th century apartment with large rooms and a wealth of period features.Large sitting room with a large bay window overlooking a tree lined avenue.The sitting room has comfortable seating for 8, open fire,TV DVD and CD player. Well appointed modern large Kitchen/Dining Room with seating for 8 . Three bedrooms. two with kingsize beds and one double bedroom .Two folding beds for extra sleeping capacity. Bathroom with modern fittings and bath with over bath shower. No reviews yet for Hyndland Road, West End Apartment.